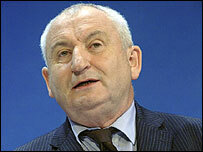 The founder of The Big Issue magazine has confirmed he is to stand as a candidate for mayor of London. John Bird, 59, said he had not decided if he would stand for a party or as an independent in the spring 2008 poll. Mr Bird said he wants to run on a platform of social inclusion and reviving local democracy. "I want to bring people into politics that have not been in politics before." he told BBC Radio 4's The World at One on Thursday. "I really believe also we need to do something to revive local democracy." Launched in 1991, The Big Issue is a news and current affairs magazine sold by street vendors affected by homelessness.